For the fourth year running, the RE Council, NATRE and RE Today represented religious education on stands at the Labour and Conservative party conferences. Representatives from all three organisations, including teachers of RE, spoke with approximately 15 parliamentarians at the Labour conference and approximately 30 parliamentarians at the Conservative conference about the importance of good religious education, and why it matters so much today in modern Britain. 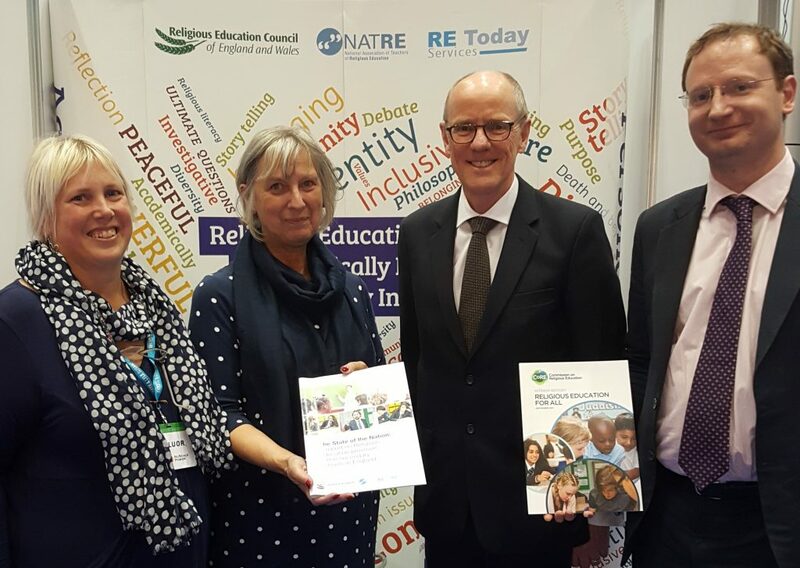 We also discussed the recently published interim report from the Commission on RE, Religious Education for All, and its ongoing work, as well as the RE Council, NATRE, and RE Today joint State of the Nation report on RE provision at secondary schools across England. We were delighted to have another opportunity to discuss the important work we’ve been doing with Nick Gibb, Minister for Schools (pictured below). MPs who visited the stand were shown data on RE provision at schools in their constituencies, and were invited to test their RE knowledge by completing an interactive quiz at the stand. Fringe events were held at both conferences on the topic ‘Divided Britain: is it time to stop parents pulling children out of Religious Education?’. Both sides of the debate were represented and both events were well-attended. The political party conferences are a unique opportunity to meet and speak with a large number of parliamentarians over the course of a few days about the key issues currently affecting RE in schools.